Keith Williams Architects’ shortlisted scheme for the new landmark Metropolitan Police HQ in London is available to view at a free public exhibition at City Hall, London SE1 from Saturday 21 September through to Thursday 26 September. Projects by the other shortlisted architects, Foster & Partners, AHMM, Lifschutz Davison Sandilands and Allies & Morrison also feature. The international architectural competition administered by the RIBA Competitions Office attracted a world-class field of architects with a great many expressions of interest from the UK and abroad. 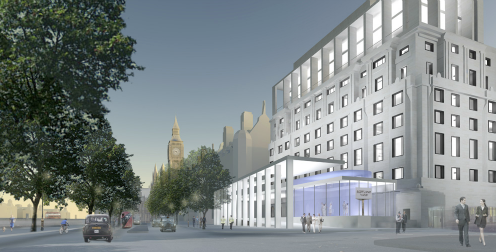 The 10,000m2 project involves the redesign and extension of the 1930s Curtis Green Building, a former police station on Victoria Embankment next to Old Scotland Yard in Central London. It neighbours the Norman Shaw and the Ministry of Defence buildings, as well as Richmond and Portcullis Houses, and features clearly as an important historic building on London’s riverside prospect. The building originally designed in 1935 by the architect William Curtis Green, will be refurbished and extended and Curtis Green building will become the Met Police’s new HQ when their current base on Broadway in London’s Victoria is finally vacated in 2105. The redevelopment of the Curtis Green building forms part of the largest ever transformation of the Metropolitan Police estate and following the competition will provide a key element in the Met’s modern, efficient, secure and cost-effective building stock – ensuring the Metropolitan Police Service remains at the forefront of 21st century policing and crime prevention. The competition winner will be announced in October.